Humbled. Flattered. Honoured. Touched. Thrilled. Inspired. 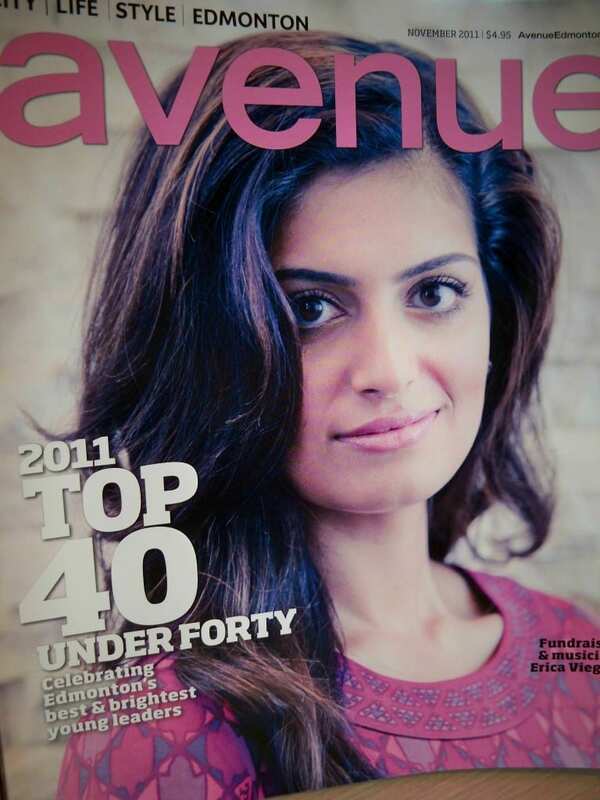 I am running out of past participles in response to Avenue Magazine Edmonton selecting me as one of the Top 40 Under 40 for 2011. 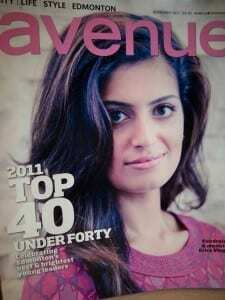 As was the case in the previous two years, the list of Edmontonians they have recognized in 2011 is an impressive one. Professors. Media celebrities. PhDs. Creative gurus. Presidents. Artists. Technology leaders. Educators. And one rockstar chef. I like to think I work hard, and give back whenever I can. And while we all love to be appreciated, I think many of us just live our lives always choosing to do the right thing, rather than choosing to do the things that get us recognition. So it takes you back a little when your efforts are acknowledged AND you see yourself surrounded by some pretty extraordinary people. You can’t help but think, do I really belong? But Avenue has spoken and belong I do. It’s been a whirlwind of fun that has produced many “this is actually happening” moments. From my interview with Kim Collins-Lauber, Avenue writer, who made me so comfortable that I threw my media training out the window. At the time, my inside voice was yelling, “Why are you talking about being shy?? Shut up now….”. To my photo shoot with Aaron Pedersen of 3Ten Photo. Maybe it was the rap music he played, or his belief that everyone has an “inner model” waiting to be unleashed, or the hair blowing fan he insisted on trying – whatever it was, it was perhaps the only time I enjoyed having my photo taken. To the hip Avenue party where they released the Top 40 names. Too anxious to eat and so thankful I had Jenn, my BFF, in tow to help ease my nerves. To seeing my spread for the first time. See for yourself how talented both Kim and Aaron are. To reading the other profiles and coming down a peg or two. It’s a ride that has only just begun. In the meantime, one very appropriate word comes to mind. Another star struck moment for me. Thanks for letting me come along for the ride. I would not have had that night with anyone else. Thank you, Jenn. Thank you, Erica, and congratulations to you! I must admit, your write-up was one of the ones where I asked myself, “Do I belong?” Impressive accomplishments. And a stunning cover! Thank you for the kind comment, Aaron and Audrey. Your support means a great deal to me.